Pure organic source of antioxidants and beta carotene for a protective defense vital in healing inflammatory disorders, cellular free radical damage and auto immune conditions. A nutrient dense profile rich in chlorophyll, b-group vitamins in particular pantothenic acid (B5) and enzyme superoxide dismutase. 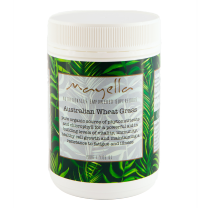 Consciously harvested to obtain optimal nutritional value, Mayella ® Australian Barley Grass is a natural whole food and daily nutritional source that is a highly recommended supplement for all women, men, teens and children. The balanced nutritional profile of this simple plant is restoring to blood vitality, an alkaline system and improved immune function. High in Vitamin C and the mineral Iron, Barley is an easily absorbed and natural plant source for this vital mineral, key enzymes such as S.O.D and high in demand vitamins such as Vitamin A, C, E, K and B Vitamins. The high concentration and bioavailability of the enzymes, vegan protein vitamins and minerals in our certified organic Barley means a complete profile of nutrition is presented, is easily digested and assimilated for maximum health benefits. 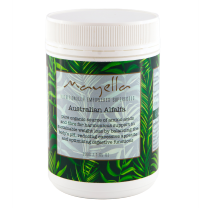 It is in supplementing with easily absorbed natural concentrated nutrients from plant sources such as Mayella ® Barley grass powder, that we are able to balance, defend and repair from free radicals and the resulting oxidative stress. Restoring the bodies ability to defend, overcome and repair against the free radicals that are naturally occurring in our body, but can get a stronghold on our systems depending on lifestyle choices, stress levels, toxin exposure and diet for example, is key to successfully creating and maintaining good health. 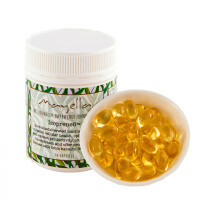 Take 1-2 teaspoons Mayella ® Barley Grass powder daily in water, juice or in a smoothie for good health and vitality. As a daily nutritional source, mix 1 – 2 teaspoons of Mayella ® Australian Barley Grass into a tall glass of filtered water, natural coconut water or your favourite fruit/vegetable juice. Alternatively, take 2-5 capsules of a morning with a tall glass of filtered water. Store in a cool dry place, below 30°C / 86°F. 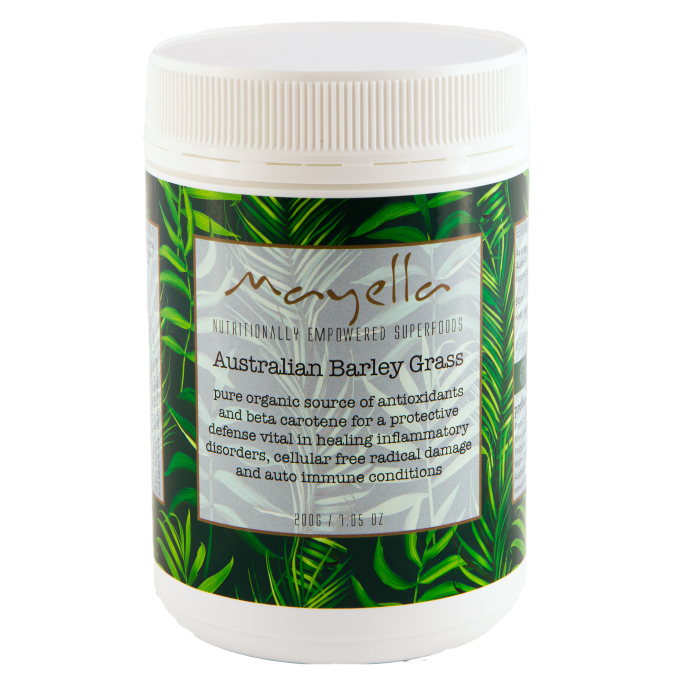 Certified Organic and Australian grown concentrated source of pure unadulterated barley grass consciously harvested, ethically sourced and formulated with love in Australia. Barley Grass* – The young green shoots of barley grass are nutrient powerhouses and are capable of high element absorption from the soil in which they are grown before they form into barley grain. High in chlorophyll to detoxify toxic build up in the intestines and a rich nutrient profile of potassium, calcium, magnesium, iron, copper, phosphorus, manganese, zinc, beta carotene, B1, B2, B6, C, folic acid, and pantothenic acid. 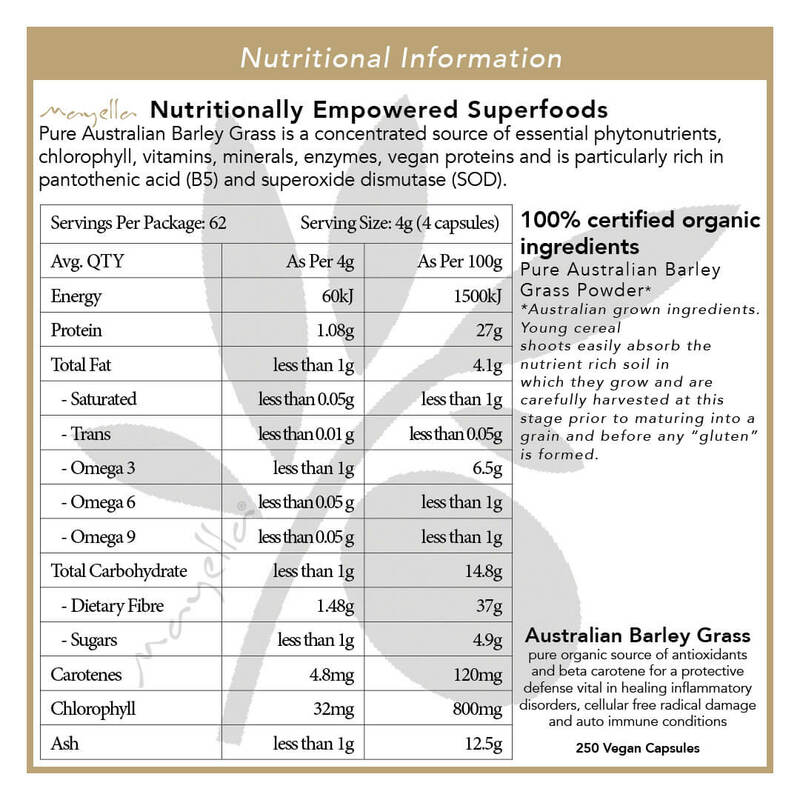 Barley grass has one of the highest natural levels of enzyme SOD (superoxide dismutase), which is a powerful antioxidant that protects the cells against toxic free radicals, thought to be a primary culprit in ageing.